SupaReel™ Complete ships with your choice of conductor pre-wound. 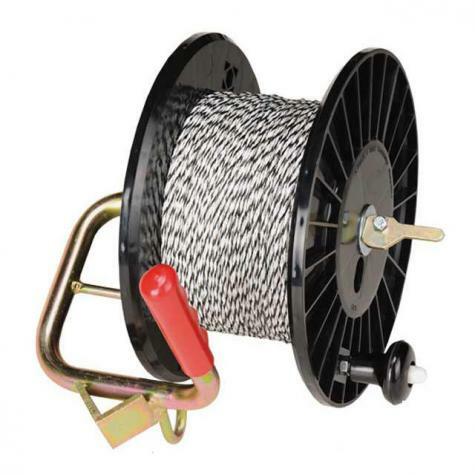 Includes: Spool, windup handle, carry handle and brake. Handle assembly required. Strongest fence reel in the US. Rugged enough to carry heavy conductors year in and year out without breaking when dropped. Built-in brake enables efficient, simultaneous unwinding of 2 to 4 reels for sheep and goat fences. Enables better grass and animal management. Using reels saves time and reduces aggravation. Offsetting lever locks reel in place or allows it to spin free. The circumference of the reel on which the conductor is wound: 17". Use this handy wood post bracket to support and hang Premier's SupaReels™. This bracket self-tightens onto a steel T post without tools. Simple, effective and inexpensive. Handle up-to three fence conductor wind-up reels at once. Useful for subdividing pastures for rotational grazing. I've used the 1320' reels for a while, and they work well for me. The 2,000' reels, however, are the Devil's handiwork! That length of wire really over-fills the reel after first use, and it's a tedious nightmare to wind and unwind. I've had tearful spells spent sitting on the ground untangling fragile wire for more than 1/2 hr, wrestling with whether I should just hack off the rat's nest with scissors. This is one product I have a hard time believing Premier uses on a regular basis, it just seems like those reels aren't big enough to handle this much line. Also, I bought the reels pre-wound, but they don't come with the handles installed. So you have to unreel them most of the way to install the handles, which defeats the purpose of paying for them to be pre-wound. You could wait to install the handles in the field once the wire is in use, but who wants to fiddle with wrench and small parts out in the grass? We no longer ship the reels with the handle attached. We've had reports that the weight of the conductor combined with the shape of the handle may cause damage during shipping. We've updated our website to indicate that handle assembly is required. I now have three Supra reels which I ordered pre-wound from Premier1. We use them to control our cattle as they strip graze our pastures. They are well made, easy to use and rugged and they work well for us. I bought pre-wound 2000' Intellatwine on a Supareel for my sheep. Works great to contain my small flock with 3 strands. They learned not to touch the fence within a day or two now they don't come near it at all. Takes about an hour to set posts then run the wire. The paddock is about 150-160' square using only one reel of 2000' and I can get 5-7 days grazing with 13 sheep. Only negative I can think of is that when rewinding the wire on the reel sometimes it comes of the reel and tangles. This gets better with practice.